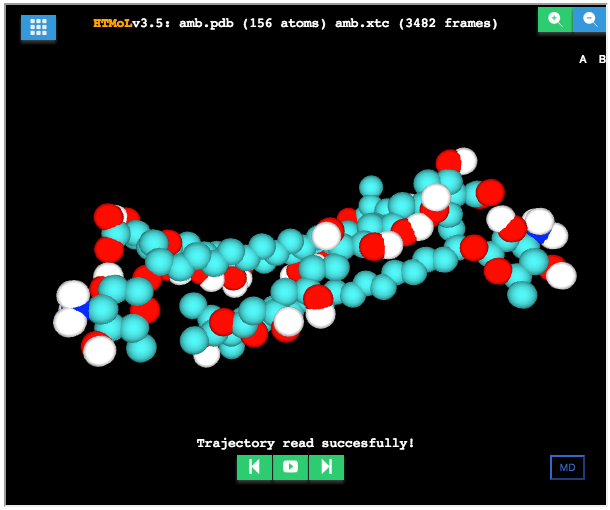 Molecular Dynamics (MD) is used in many fields of science. The visualization on the right is not a movie, it is the interactive display of actual atomic space and time dependent data of a protein generated with MD. In the example, the N- and C- terminals are shown in magenta and yellow, respectively. All the residues of type TRP are highlighted using the VDW representation. By visualizing the MD trajectory, it is clear how the residue exposed to the solvent has a much higher movility than those residues buried in the hydrophobic core of the protein. More specific details of the system and simulation can be viewed by clicking the "MD" button on the lower right corner. When the trajectory is loaded, Play-Pause or move back and forth one frame at a time. 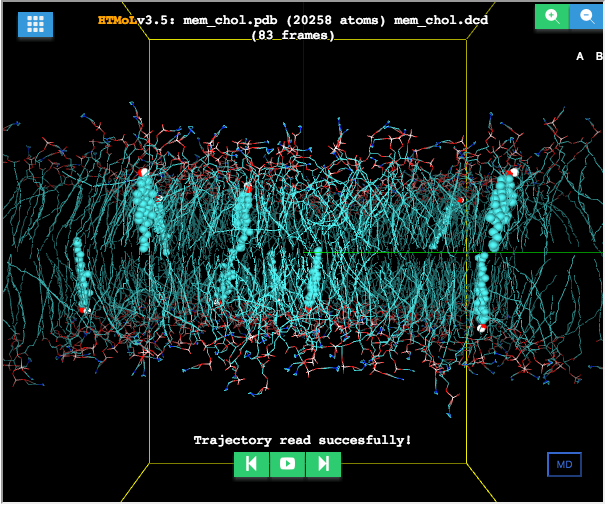 Rotate the molecules with the mouse by click & drag, zoom in or out. Show/Hide the Main Menu by clicking on the top-left corner. 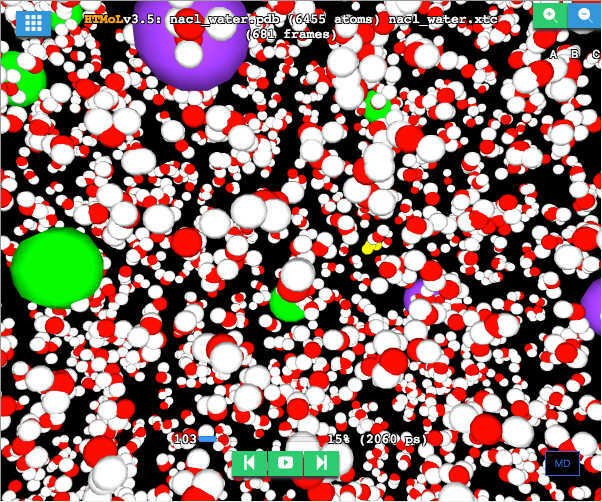 If you do not see the molecule, maybe your browser does not support WebGL. 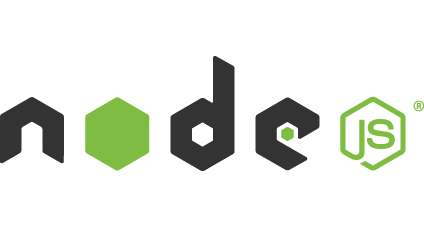 Follow directions at the Node.js site for installation on a web server. It is easier to use a Package Manager. 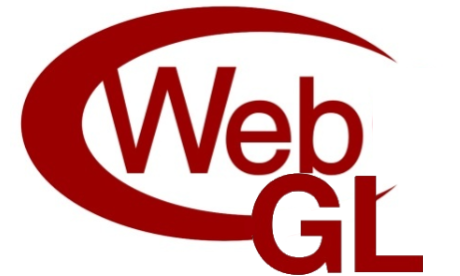 WebIP [127.0.0.1] is the servername or IP address of the web server. Use 'localhost' for testing. NodePort  is the port number where the BinServer will be listening for requests. It can be any available port with a number greater than 1024 (lower values require root access, which is not advisable). Note, do not use port number 80 because it is usually reserved for Apache by default. Sometimes you might have to enable this port for TCP/UDP transport at the network switch/router if the server is behind a firewall. PDBDIR [pdbfiles/] is where the atomic coordinates are located. TRJDIR [trjfiles/] is where the MD trajectories are located. pdbInicial name of the file with the atomic coordinates in PDB format. trjInicial name of the MD trajectory file. trjFormat format of the MD trajectory file (Options: XTC, DCD, NC). See an example here. Other variables can be optionally set for further configuration. See the Documentation section. If you get a mesage like "Error: listen EACCES" or "Error: listen EADDRINUSE", you might have to try a different port number (NodePort). Find one that is open and not in use by other service. A functional port depends on your server configuration, so you might have to try several numbers before finding one that works. > Connection to WebIP NodePort port [tcp/*] succeeded! Attribute class with the value "HTMoL"
Attribute scrolling with the value "no"
That's it. Also, HTMoL can be embeded in WordPress blog posts (and possibly in other blog platforms). An example can be found here. autoplay [true] How to start the MD visualization: (true|false). RepresentacionInicial ['SpheresBonds'] Equivalent to CPK. Do not change the representation here, use the 'show' command below. SphereResolution  value has to be >3, use 5 for low resolution, 16 for high resolution. This has an impact in GPU performance. AxisBool [false] Draw Axis (X red, Y green, Z blue) and Box (yellow): (true|false). 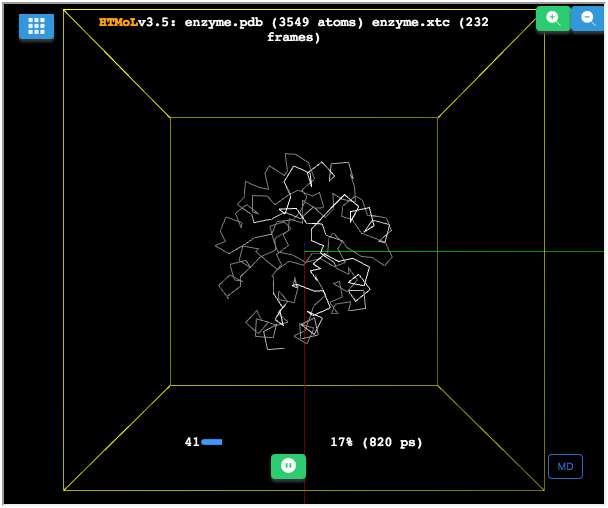 To draw the Simulation Box, the dimensions need to be specified with the command CRYST1 in the PDB file. commandsDefault Define a combination of representations, views and zoom level (see Commands Section below). The example shown here uses the following commands:	"select 1-9;show VDW;color 1.0,0.0,1.0;select 3540-3549;show VDW;color 1.0,1.0,0.0;select 0:TRP:0;show VDW;color atom;select none;view BackView;zoom 3;"
tinit  MD start time in picoseconds. md_dt [0.002] MD timestep in picoseconds. nstxtcout  Output frequency saved in trajectory file. MDTitle ["MD Title"] Provide a title for the MD. MDdescription [" <p>Summary: </p> <p>PDB ID: <a href='https://www.rcsb.org/pdb/explore/explore.do?structureId=PDBID' target='_blank'>PDBID</a></p> <p>Simulation: </p> <p>Published in Journal Volume:Pages (Year) DOI: <a href='http://dx.doi.org/my_doi' target='_blank'>my_doi</a></p> "] Provide the Summary, PDB ID, Simulation details, Publication link, etc. Each section should be inside a <p></p> block. HTML code allowed. 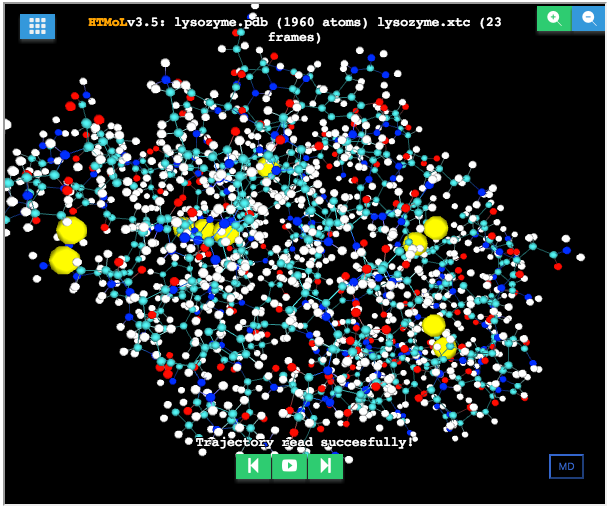 HTMoL has a set of commands implemented to control how the molecular system and trajectory are visualized ("select value; show value; color value; view value; zoom value;"). This structured language can be used in the commandsDefault parameter defined in the local/config.js file. select 0:0:A Selects all atoms of the chain with label "A"
select C:ALA:B Selects the atom type "C" of residues type "ALA" of chain with label "B"
show [cpk] Options: vdw, cpk (set radius=0.3), lines, trace. color [atom] Options: atom, red, white, green, blue, magenta, yellow. Advanced: it can also be defined by setting the RGB values of the desired color. Each of the three components has to be comma separated and be in the (0.0-1.0) range. view [FrontView] Options: FrontView, LeftView, RightView, UpView, DownView. Advanced: a "Custom" view can be defined at the js/ButtonsFunctions.js file in the UserSetView function. zoom  Positive integer to zoom in, negative integer to zoom out. You may remove explicit solvent (e. g. water) and cut the trajectory file to the relevant part of the simulation where the specific events or process take place for visual clarity, decrease storage file size, and increase transfer speed. Also, some times it is helpful to remove high-frequency movements with a low-pass filter. However, the final trajectory file should not be used for analysis but for visualization purposes only. As a good practice, always provide the MD description and simulation details. HTMoL is a free application for academic use. This includes research and teaching purposes. It is distributed with an Open Source License Agreement. You can always find the latest version of HTMoL in GitHub. How does the GUI work? The main Menu gives access to several functionalities grouped in five categories: Files, Representations, Tools, and Views (A1). The principal info-bar indicates when the data files are being transferred, if there is a communication error, or the progress of the MD trajectory in frames, percentage, and time lapsed in pico-seconds when played (A2). The trajectory controls allow the user to play, pause, or move one frame forward or backward (A3). The secondary bar gives information on the loaded molecular structure (name and number of atoms) and trajectory data (name and number of frames), B1,2. Different molecules in the system are identified by a distinctive ChainID label, which are displayed (B3). These labels function as a switch to turn on (white label) or off (red label) the display of the corresponding molecule. The user can rotate the view at any time by click-and-drag with the mouse anywhere inside the application's viewport (C1). Clicking on an atom will show related information (atom's number, type, name, and X-Y-Z coordinates, and molecule's name and number) in the principal info-bar. If the simulation box is defined in the coordinates file, the computational cell can be displayed (yellow lines) along with the coordinates system (X in red, Y in green, and Z in blue lines), through the Menu-Tools-Axis\&SimBox function (C2,3). HTMoL uses a perspective camera to display the system (D1). The user can zoom the view in or out through the corresponding control buttons (D2). The back-end-user (server admin) can provide information on the molecular system and the MD simulation protocol details. These are defined in the back-end's configuration file. The front-end-user can access the information set without disrupting the display view by clicking on the MD-button. A modal-window will show all the information set in the configuration file under the MDTitle and MDdescription parameters (A1). A common action is to measure the distance between two atoms or the angle defined by three atoms. HTMoL provides this function through the Menu-Tools-Measures (A2). Once selected, the front-end-user can click on two atoms to display the distance, or three atoms to display the angle. The selected atoms will be highlighted in green (B1,2). The measured value will be displayed and updated on every MD frame as the trajectory is played. HTMoL implements a non-deterministic finite automaton to make atom selections by a set of commands parsed through a syntactic analyzer. The selection can then be modified by a variety of visualization options through the back-end's configuration file, the Console on the Tools menu (A3), or directly on the Representations menu. These include different geometries (e. g. line or Bond, ball+stick or CPK, spacefill or VDW, and back-bone trace) and different color schemes (name or RGB values). A command set is defined in HTMoL. Hence, the back-end-user can set-up a stage which accents or highlights an important region or molecule in the system for the front-end-user to appreciate by just opening the application and playing the MD trajectory. Likewise, the front-end-user can also modify and interact with the molecular system through the Console interface when the application is on Full-window mode (C1). The Console interface is disabled when the applications is embedded on a webpage because the viewport size restrictions would make it impractical to use. Sure! we always welcome new contributors for developing additional functionalities. If you are interested in contributing to the HTMoL project in any way (e.g. improving or extending code/capabilities/features, documenting, etc.) please let us know. How do I properly cite HTMoL? Proper citation is essential to continued funding for HTMoL development, as it is the primary way in which we demonstrate the value of our software to the scientific community. M. Carrillo-Tripp*, L. Alvarez-Rivera, O. I. Lara-Ramírez, F. J. Becerra-Toledo, A. Vega-Ramírez, E. Quijas-Valades, E. González-Zavala, J. C. González-Vázquez, J. García-Vieyra, N. B. Santoyo-Rivera, A. Meneses-Viveros and S. V. Chapa-Vergara. 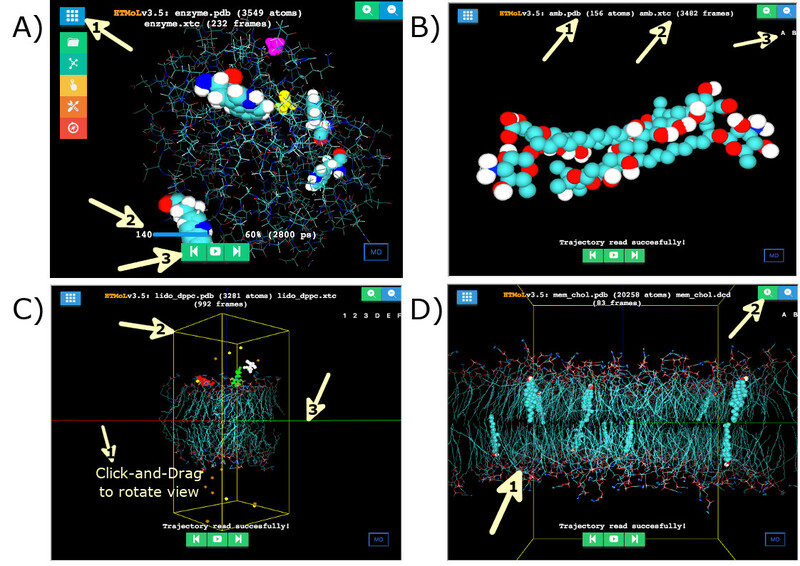 HTMoL: full-stack solution for remote access, visualization, and analysis of Molecular Dynamics trajectory data. Thank you for your attention to these details. Please let us know what's the problem you're having. This is the data set used to characterize and compare HTMoL with similar applications. Tools are installed side-by-side in the same server, streaming the same data files. Modern browsers can measure the display frame rate and show the FPS count. In Chrome (v65) go to View-Developer-Developer Tools-Rendering-FPS meter, and in Firefox (v59) go to Tools-Web Developer-Performance-Start Recording. A new tab will open by clicking on a link, loading a specific system. To estimate the tool performance, look at the FPS while the MD dynamics are playing after one full trajectory cycle. The higher the value, the greater the performance. Ordered by system size. Click images to open full-size HTMoL in a new tab. Amphotericin B (AmB) dimer, monomer 1 labeled as chain A, and monomer 2 labeled as chain B.
VDW representation. Solvent not shown. Low-pass filtered XTC trajectory for smooth movement (visualization purposes only). 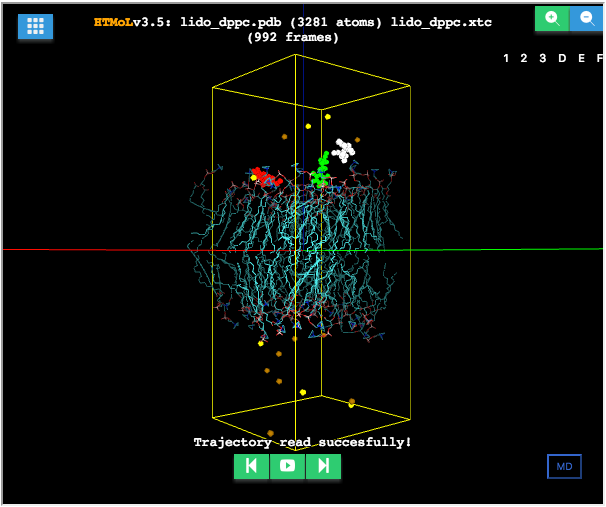 select 0:0:B;show VDW;color atom;zoom 4;"
Lysozyme with disulfide bridges shown. CPK representation. Solvent not shown. Unfiltered XTC trajectory. Three anesthetic molecules interacting with a DPPC bilayer, monomers individually labeled as chanis 1, 2, and 3. Phospholipid molecules labeled as chain D. Ions Na and Cl labeled as chains E and F.
VDW and line representations. Simulation Box shown. Solvent not shown. Low-pass filtered XTC trajectory. Custom view. Same protein shown in the intro but in backbone representation. Solvent not shown. Simulation Box shown. Low-pass filtered XTC trajectory. NaCl in water (chains B,C, and A respectively). DPPC bilayer with cholesterol (chain A). Phospholipid molecules labeled as chain B.
VDW and line representations. Simulation Box shown. Solvent not shown. Low-pass filtered DCD trajectory. If you are interested in contributing to the HTMoL project in any way (e.g. improving or extending code/capabilities/features, documenting, etc.) please let us know. Proper citation is essential to continued funding for HTMoL development, as it is the primary way in which we demonstrate the value of our software to the scientific community. Thank you for your attention to these details.